Government of Delhi has notified 20 days in 2014 as Dry Days in Delhi. These 20 days include 3 national holidays of Republic Day, Independence Day and Gandhi Jayanti. Other than these there are 17 festival days which are dry days. What does Dry Day Mean? Many people are confused what happens in dry days. Liquors Shops: On dry days the retail/ wholesale shops selling liquors are closed and so you cannot buy it. 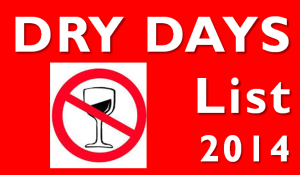 Bars & Hotels: Service of liquor in licensed Bars / Hotels / Clubs and Restaurants is permissible even on dry days except on above three National holidays. Hotel Rooms: Even on the three National holidays, liquor can be served in hotel rooms provided they have L-15 license for room service. At Home: There is no ban for service of liquor by anyone at his residence provided the liquor served is authorized and is within the permissible limits.